ESO Supernova Exhibition — How do planets form? In our Solar System rocky planets formed in the hot inner parts of the protoplanetary disc, while gas giants formed further out. In other systems, the story may not always be the same. Mind the gap: Gas is still present in the concentric gaps of some planet-forming discs. Eventually, the gas will be cleared by the gravity of new planets (artist’s impression). Planetary nursery: Close to the star, dust particles grow into planetesimals and Earth-like planets. Further away, gas accretes on planetary cores to create Jupiter-like giants (artist’s impression). Once pebble-sized particles have formed in a protoplanetary disc, they grow into larger bodies through collisions: so-called planetesimals about 1 km in size. Eventually, rocky planetesimals accrete into Earth-like planets. Further from the central star, where temperatures are lower, volatile gases condense and icy planetesimals grow into the cores of giant planets, which attract thick mantles of gas from the disc. But we don’t understand planet formation very well: the simple sticking together of dust is not effective for larger particles and it seems that planets move closer to their sun during their formation process. A planet is born: Orbiting a star smaller and cooler than our own Sun, Kepler-62e is a super-Earth, formed from accreting planetesimals (artist’s impression). Collateral damage: Colliding planetesimals create belts of smaller debris and dust particles, like the asteroid belt and the Kuiper belt in our own Solar System (artist’s impression). 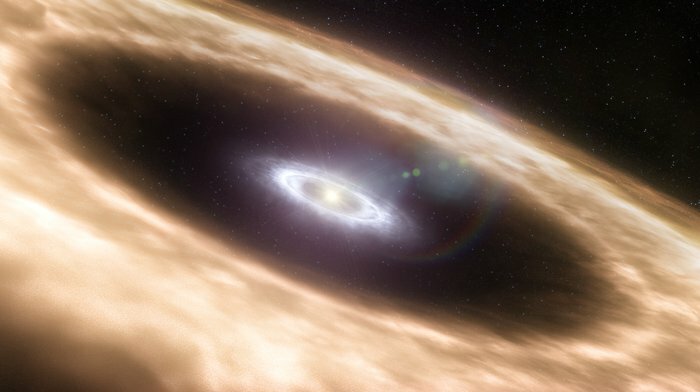 Planetary snow line: The temperature gradient in a protoplanetary disc determines what kind of particles and molecules can solidify out of it (artist’s impression). Gravity is the force that builds worlds. It makes pebbles stick together and grow into rocks, then boulders, asteroids and planets. It sounds simple, but we don’t really know the details.